There must be some musicians who you are interested in but having no chance to listen to properly. In my case, it was Little Glee Monster. I happened to see them appear on a TV program called Music Fair a while ago. My eyes were riveted on the TV screen due to their song which sounds like the one from Motown label in the 60’s and their skills as singers. The song which they sang then was “Koi wo Aserazu”. I was unable to contain myself checking their songs on YouTube and I finally downloaded their new album from Amazon. 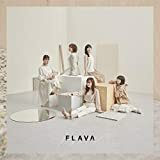 The album titled “FLAVA” is dazzlingly full of freshness. I thought it is perhaps because of the image of the first song titled “Sekai wa Anata ni Waraikakete Iru” which is the CM song for Coca-Cola. Actually, you may feel the sparkling sunshine and a freshly blowing breeze through the whole album. I feel like going out to enjoy the sunshine outside, even though I am definitely indoor type. I think this album is a bargain because it contains all of 17 songs including a Motown medley and some live music.